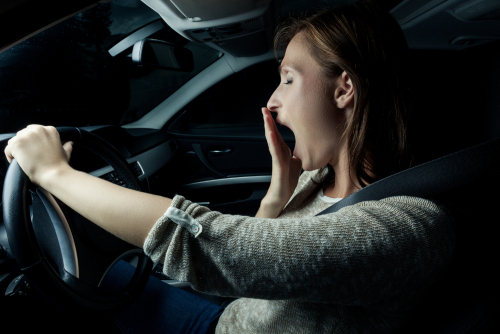 It is a well-known fact that too little sleep radically affects a driver’s attention, awareness and reaction time in a vehicle. Motorways and dual carriageways are the most common roads for sleep-related crashes, due to the monotonous journey and lack driver stimulation. Furthermore, a crash due to drowsiness or sleeping at the wheel tends to be at high speed because of the failure to react and brake before the crash. This means a higher risk of death or serious injury. What happens if you leave it too late? A ‘microsleep’ is when you nod off for around two to thirty seconds without realising it. It is more common in monotonous situations, like motorway or night driving. The driver may feel like they’ve just briefly nodded their head, but they have actually been asleep. In six seconds, a vehicle being driven at 70mph travels about 200 metres, which is enough time to veer across three lanes of traffic or into the central reservation. Simulator studies have shown a clear relationship between micro-sleeps and crashes. 40 per cent of crashes involved a commercial vehicle, because their drivers typically spend longer hours at the wheel. Interestingly, drivers under 30 are at higher risk than older drivers to crash due to tiredness in the early morning after little or no sleep. Lack of sleep or disturbed sleep: A bad night sleep due to stress or outside influences, sleep disorders such as narcolepsy, insomnia or sleep apnoea. Time of day: The most common times for drivers to fall asleep at the wheel are early morning (2am-6am) and early afternoon (2pm-4pm). These times are when the body clock reaches a natural dip, causing drowsiness. Stress: Leading to tiredness and difficulty concentrating. Irregular sleep patterns: This can be a problem caused by irregular work shifts and switching from day to night shifts without having sufficient time off in between. Research has found shift workers are particularly high risk for sleep-related crashes . Driving for long periods: Driving deteriorates after two hours of continuous driving. The longer you drive, the more rest you need to recover driving performance. Breaks are therefore recommended every two hours. Car Comfort: Modern vehicles are usually quiet and comfortable for the driver, meaning a more relaxed drive. This can lull drivers, particularly in vehicles fitted with comfort-enhancing features such as cruise control. Medication: Some prescription and over-the-counter drugs can cause drowsiness and impaired alertness. Check with your doctor or pharmacist. Avoiding tiredness is simple – get plenty of rest beforehand, particularly if setting off early in the morning: at least seven to eight hours is recommended. If driving late in the day, especially after a busy day, having a nap before setting off can help alertness. Planning a long journey, include breaks of at least 15 minutes every two hours and if you feel tired stop and take a break, even better have a cat nap. You can also try winding down the window, listening to music and talking to a passenger. A caffeinated drink, such as coffee or an energy drink, is effective in reducing driver tiredness over short periods. However, this is only a short-term solution. Also remember that if you have a condition associated with fatigue, you have to inform the DVLA. For incurable conditions, like narcolepsy, drivers must contact the DVLA on diagnosis to relinquish their licence and it is a legal requirement for medical practitioners to tell them to do this. A driver who fails to notify the DVLA can be fined £1,000 or prosecuted for failing to do so. Come off at the next exit and find a service station or somewhere to buy refreshments and take a nap. A tired driver who kills someone can be charged with death by dangerous driving or the lesser charge of death by careless driving. The maximum penalty for death by dangerous driving is 14 years imprisonment and the maximum penalty for death by careless driving is five. Want to know more about the effects of driving while drowsy? Read here to find out more.